January 31, 2019 – The summer of 2017 saw the first and only finance museum in Switzerland, the country of banks, open its doors in Zurich-West. Now the European Museum Forum has honored the museum by nominating it for the European Museum of the Year Award 2019 (EMYA). The Swiss Finance Museum was one of four Swiss museums put forward for this prestigious award. A glimpse of the permanent exhibition at the Swiss Finance Museum. Photo: Schweizer Finanzmuseum. The Swiss Finance Museum opened in Zurich-West in June 2017. 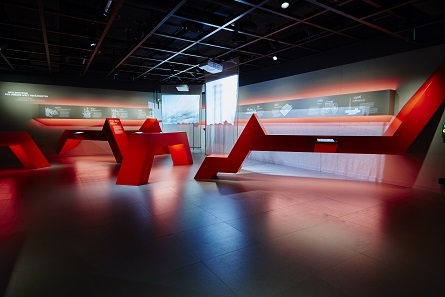 The exhibition boasts an entirely new design and combines historic exhibits with the latest multimedia installations to explain the origins of today’s global economic system and the unique Swiss financial market and its infrastructure. 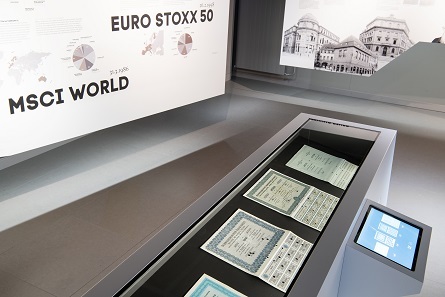 The latest special exhibition of the Swiss Finance Museum presents the history of the SMI. Photo: Schweizer Finanzmuseum. The latest special exhibition is “30 Years of the SMI: Equity Indices Explained!”, detailing the history of the Swiss benchmark the SMI and explaining the significance of equity benchmarks in general. A share of the General Electric Company takes visitors back to the early days of the Dow Jones Index, while touchscreen installations and selected Swiss securities show how the Swiss economy has developed over the last 30 years. The award ceremony will take place at the EMYA Conference 2019, which is being held from May 23 through 25, 2019, in Sarajevo. Along with the four Swiss museums nominated are other candidates from European countries. In addition to the main prize, one museum each will be given an award for outstanding work in five further categories. A team of ten European judges will select the winner. All judges hold leading positions in the museum sector. The EMYA was founded under the auspices of the Council of Europe and has been awarded to selected European museums every year since 1977. The European Museum Forum, which provides the legal and organizational framework for the EMYA, works to encourage and reward quality and innovation in museum practice. Previous winners include the Guggenheim Museum in Bilbao and the Victoria and Albert Museum in London. More information about the Swiss Finance Museum is available on the official website. The website of the EMYA tells you more about the history of the award. Here you will find all the awardees of 2019. Among them are for example the Historisches Museum Frankfurt and Lego House in Denmark.